It had never occurred to me to me that it didn’t, but in that moment, before I went on to answer Susan, it loomed large. Did it belong enough, that is, for me to use it in a story? 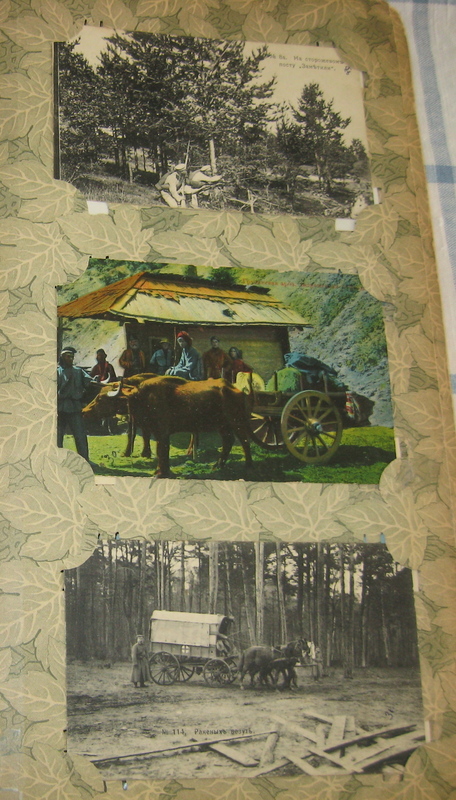 Postcards from my grandfather Harder’s album, including staged Russian army scenes. Well, of course it does, I answered myself, and I proceeded to reply (read interview here) with a briefer version of the following. I said my background was Mennonite, traditionally conscientious objectors, and both my grandfathers served as medics, though in the Russian army, the one on the Austrian front, the other in the Caucasus region, because they lived in Russia at the time. I entered the war years via my maternal grandparents’ lives, because of her diary, their 80 or so love letters while he served on the Red Cross trains, and the postcards he collected during those years. But lose anyone? No. And admittedly a long way from the cliffs of Dover and all that. Plus Russia pulled out early. Still, the Great War was a significant lead-in to the Russian Revolution and civil war that followed, which in its turn was a major factor in both sets of my grandparents coming to Canada. Which meant that I grew up Canadian, and– in the education I got– became rather British-Canadian. I mean, we knew which side we were on. Growing up even more, I read books about the war. One of the characters in my novel This Hidden Thing, for example, reads Remarque’s compelling All Quiet on the Western Front, which of course I read before I used it, and in a university course I read Paul Fussell’s penetrating The Great War and Modern Memory. And many others. I replied with some of this not to prove my right to the story–to history–as much as establish a thread of interest. But it leans towards what I see is always a question for me as a writer. In situations where someone shares some difficulty or grief, one shouldn’t say–so we’re told–I know how you feel. Because chances are one doesn’t exactly, so don’t make assumptions, and it’s not that comforting anyway because the person believes their circumstances are unique. Advice commonly handed to writers is, Write what you know. Also, fair enough. But, what does one actually know, and when is it enough to venture it in a story? I remember when I was researching/writing (somewhat on the sly) my first novel, Under the Still Standing Sun, set in a Mennonite colony in Paraguay, where we happened to be living for a term because I’d married someone from there, and I was asking an older man about some of the events I hoped to portray. He graciously answered, then said, his voice a sigh and full of doubt, something along the lines of You couldn’t possibly understand. Which I heard to mean, you as in younger, a woman, not raised here, not going through it, etc. The man’s comment only emboldened me to stubbornly try. I also know that the best parenting advice I got was from a book by Bruno Bettelheim in which he said that though you can’t enter your child’s experience directly you can always draw on your own experience of …….. (fill in the blank: humiliation, fear, joy, etc.) to find the insights to respond properly. I think that’s what writers attempt in matters they haven’t been through themselves. I also know that stories come begging, and they rarely concern what I know in a solidly this happened to me kind of way. I lead a mostly dull, contented life. They entice me with things I don’t yet know, or want to figure out, both in terms of the narrative facts, which may need research, and themes that lie beneath. Like the intrepid fools writers are when they start a story, I throw up a bridge and march across. Does that mean it belongs to me? I don’t know. But there I am, insisting it does. This entry was posted in Personal, Writing and tagged "Mask", Dora Dueck, First World War, Susan Sanford Blades, The Malahat Review, write what you know by doradueck. Bookmark the permalink. Yesterday I Heard Margaret Atwood voice very similar thoughts (especially those in your last paragraph) in an old interview from the 1970s. She sounded quite annoyed when the interviewer insisted that she must be drawing from her own experience and also talked about her life being way too dull to write about. Good defense, Dora! I very much look forward to reading your novella. Thanks so much for your comments, both Elfrieda and Gabe! I caught just the last bit of that feature on Margaret Atwood, but appreciated it too. She’s such a smart-thinking/talking person about so many aspects of being a writer; it’s encouraging.– Further to that brief though surprising reaction I had I’m wondering if somehow I feared that it would be assumed that those in the conscientious objector/pacific tradition have to step aside for that part of the history. Dora, thank you for providing the link to the interview. I found both the interview and your response very interesting–the insight into how you grow your stories; the information about your great-grandparents, and your comment about feeling very “British-Canadian” even though you’re family is not “English.” I, too, identify with England and its history. English is my language, my only language, and I love English literature. My family religious heritage may be German-language Mennonite, but my intellectual heritage is English. Your current novel sounds very interesting. I look forward to reading it someday. Dora, I have been greatly informed my Isabel Allende’s “My Invented Country” in which re writes about Chile as she remembers, ie, knows it. She explicitly disavows that everything is factually correct but it is as she remembers it. It seems to write from the perspective is very freeing. No need to argue that everything is 100% accurate …. nothing ever is…. because there are always other perspectives. You are a very careful writer, and that is a strength, but you should also (continue to) invent as you wish.